Mentor and mentee applications for the 2014-2015 school year are now open! Please apply by October 8th, 2014. Please see our Mentee Page/Mentor Page or Application Page for more details on applying to be a mentee or mentor. Who’s invited? Everyone! 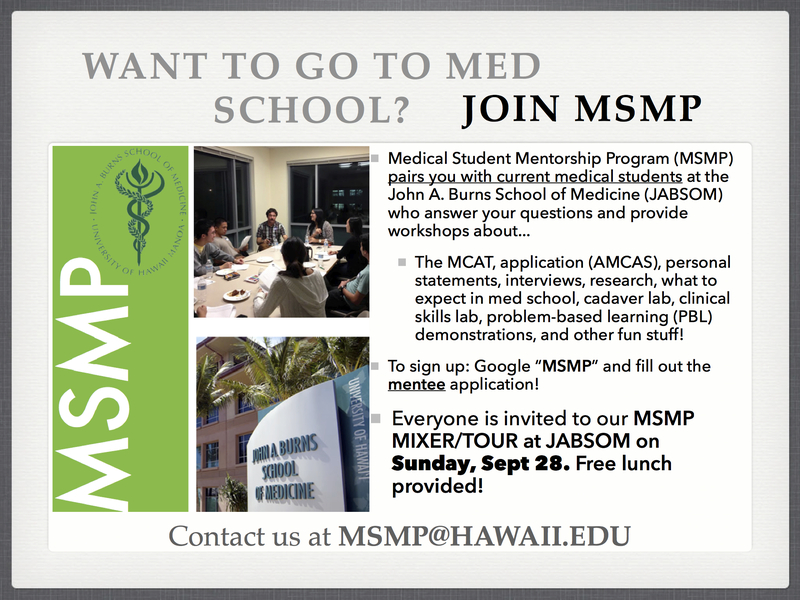 We encourage current mentors and mentees to attend, but even if you have not signed up for MSMP, we welcome you to attend this event to learn more about our program and JABSOM. If you are interested in attending, be sure to submit your RSVP by September 26, 2014! Next story Medicine Panel, Other Workshops This Week! Previous story Fresh new look!